Woodside, NY Real Estate Analysis | Vickie Palmos – Results! Woodsideis aworking-andmiddle-classresidential and commercial neighborhood in the western portion of theboroughofQueensinNew York City. It is bordered on the south byMaspeth, on the north byAstoria, on the west bySunnyside, and on the east byElmhurstandJackson Heights. Some areas are widely residential and very quiet, while other parts, especially the ones aroundRoosevelt Avenue, are more urban. The neighborhood is located inQueens Community Board 1andQueens Community Board 2. In the 19th century the area was part of the Town of Newtown (nowElmhurst). The adjacent area of Winfield was largely incorporated into the post office serving Woodside and as a consequence Winfield lost much of its identity distinct from Woodside. However, with large-scale residential development in the 1860s, Woodside became the largestIrish Americancommunity in Queens, being approximately 80% Irish by the 1930s and maintaining a strong Irish culture today. In the early 1990s, manyAsian Americanfamilies moved into the area, with the population being 30% Asian American.South AsiansandLatinoshave also moved to Woodside in recent years. Reflecting its longtime diverse foods and drink, the neighborhood is filled with many cultural restaurants and pubs. It is also home to some of the city’s most popularThai,Filipino, andSouth Americaneateries. 1908 map of the town of Newtown. 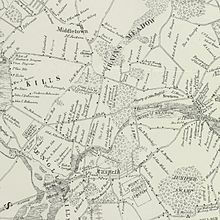 Detail from Map of Newtown, Long Island. Designed to exhibit the localities referred to in the “Annals of Newtown.” Compiled by J. Riker, Jr. 1852. In the 19th century, the area was part of the Town of Newtown (now Elmhurst). The adjacent area of Winfield was largely incorporated into the post office serving Woodside and as a consequence Winfield lost much of its identity distinct from Woodside. Around the roots of the old tree were the huts and stables of the cavalry: with a number of settler’s huts ranged in woods… Great festivities too were constant in the spacious rooms of the old Moore house, during the winter months when the snow was deeper and the frost more cold than now-a-days. To the streaming lights from the ball room, and the lanterns hung on the trees, were wont to assemble the gay sleighing parties from the Sacket [i.e. Sackett], Morrell, Alsop, Leverich and other houses; for the soldiers were all over and had come to Newtown to recruit [i.e. refresh and restore] themselves after the yearly campaigns… Is there any relic more associated with Newtown [i.e. the town in which the village of Woodside would come to be located] than its old chestnut tree?… [Has it] not been for two centuries the “Legal Notice” centre of Newtown, for all vendues, real estate transfers, town meetings, lost “creeturs” and runaway slaves? By the middle of the 19th century, drainage and improved agricultural techniques had increased the proportion of Woodside’s arable land to some two-thirds of the total. Flowers and dairy products were added to the fruits and vegetables which farmers took to city markets. These landowners also reaped benefits from improved transportation. Mid-century construction of a plank road from Newtown to Williamsburg and a later one from Newtown to Hunters Point made access to East River ferries quicker and easier. In 1860 a corporation presided over by a local resident, John C. Jackson, built a gravel-topped toll road between Flushing and the ferry at Hunters Point. 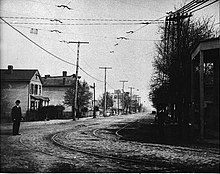 The Plank Road disappeared during construction projects of the later 19th century but Northern Boulevard tracks closely resemble the route of Jackson Avenue. 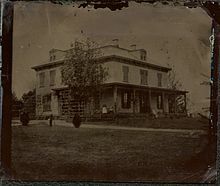 A decayed tintype, showing Hillside Manor in the 1870s. A photograph of the area from a book published in 1899. A 1905 postcard photo of a trolley line in Woodside. This sheet from a 1909 atlas of Queens was used for fire insurance purposes. The improvements in transportation that initially benefited agriculture eventually produced its decline. As it became quicker and more convenient for residents to travel from their homes to other parts of Queens, to Brooklyn, and to Manhattan, the area came to be seen as both desirable and affordable for the construction of housing for city-dwellers and increases in land values enticed farm owners to sell out. John Sackett came of a family of religious dissenters that had settled in Queens late in the 17th century. In 1802 he inherited a farm of 115 acres including much of what is now Woodside and in 1826 his heirs sold much of the property to John A. Kelly, the son of a German immigrant, and his sister-in-law (also of German descent), Catherine B. (Friedle) Buddy. As other well-to-do merchants had done in other areas of Queens, Kelly and Buddy bought farm property for use as a rural estate where they planned to live in the warmer months of the year. Not long after, a friend of Kelly’s, William Schroeder, bought another parcel of the Sackett property for the same purpose. Like Kelly, he came of a family that had emigrated from Germany and, like Kelly, he had achieved wealth as a merchant in Charleston, South Carolina. Unlike Kelly, however, he did not move North, but kept the estate for use during summer vacations. As farms gave way to country estates, so country estates would, in turn, give way to residential development, as, in the decades after 1850, the land was broken into small lots for construction of single-family houses. As before, this new shift was brought about largely by improvement in transportation resources. In 1854, the first steam-powered passenger rail service came to the area. In that year a passenger depot of the Flushing Rail Road from Long Island City to Flushing opened for operation near the southern boundary of what would become the village of Woodside. The line gave access to New York City via the Hunters Point Ferry and to Brooklyn via horse-drawn omnibus. In 1861 a second line opened running directly through what would shortly become the village of Woodside. This was a segment of the Long Island Rail Road which operated between Hunters Point and Jamaica, replacing an earlier segment which passed through Brooklyn to the ferry dock in Williamsburg. In 1869, another line, the Flushing and North Side Railroad, traversed the same path through Woodside. And soon after, in 1874, a short spur, the Flushing and Woodside Rail Road opened its station in the village. The construction of this rail service led directly to the division of property near train stations into small lots for construction of houses for working-class families. 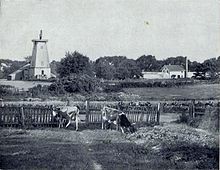 The area that would become Woodside was not the first community to grow out of Queens farmland. Before the end of the 1850s Woodhaven, Astoria, Maspeth, Corona, Hunters Point, and Winfield all attracted land speculators. Woodside’s developers were, however, among the first to divide properties into lots for construction of small homes for working-class families. In doing so they were the first to use a set of new sales techniques to lure buyers. And they were the first to apply a name to a locale which emphasized its real or supposed virtues. A late 19th century author said “Woodside” was an appropriate name for the community these land speculators created. He maintained that others, created later, were “without the slightest significance, historic or otherwise, and of the kind apparently chosen by boarding school girls to roll romantically from the tongue.”. These included Ozone Park, Corona, Winfield, Glendale, Laurel Hill, Elmhurst, and Linden Hill. The real estate promoters who created Woodside were mostly of German extraction. Members of the Kelly family were first, followed by Alpheus P. Riker, Henry G. Schmidt, John A. Mecke, and Emil Cuntz. The Kelly family developed the property where they resided while the others bought land specifically to divide it into building lots. Riker came from a German family that had settled in Queens while it was still part of New Netherland. The Kelly family was linked to A. P. Riker’s by marriage. Riker, a customs officer, was John A. Kelly’s son-in-law. Members of the Kelly family were publishers and it may not be a coincidence that the agent with whom the Kellys contracted for development of Woodside farmland was a publisher of sheet music, periodicals, and “subscription books” named Benjamin W. Hitchcock. Hitchcock had a flair for publicity and innovative sales techniques. Once the area had been surveyed and 972 plots laid out, he organized excursions from the city, hired brass bands to play, and gave prospects free lunch. The first sales event took place on February 18, 1869. Hitchcock priced empty lots at $300. Employing an innovative sales technique, he sold them on the installment plan. Purchasers made a down payment and owed $10 a month until the note was paid off. He took a 25% commission on each sale. To entice purchasers he sold lottery tickets with first option on choice lots as one set of prizes. Other prizes included option to purchase one of five houses already built on the property. It may have been he or perhaps Kelly who gave the name “Woodside” to the area. A member of the Kelly Family, John A. F. Kelly, had used it in occasional pieces he had written for a local newspaper during the 1850s and 1860s. In 1899 one of the original purchasers told a reporter than he had bought a lot with a tiny house on it, only 20′ wide by 16′ deep. The price was $480 and he paid $125 down and $10 a month until he’d paid off the note. Hitchcock had an instinct for spectacle akin to P.T. Barnum’s. After his success with Woodside he undertook similar real estate promotions in other parts of Queens including hamlets that he dubbed Corona and Ozone Park. When the economy soured and that business declined, he ran a theater, got involved in machine politics, and sponsored some beauty contests including one, the “Congress of Beauty and Culture,” which was censured for its overall sleaze and the swindling of its participants. While the other major landowners of Woodside used agents to develop their holdings, A. P. Riker set up a real estate office in the center of the village from which he managed his own property and handled real estate transactions for others. He was also a partner in local businesses: a grocery store in 1876 and, in 1878, a fruit and vegetable canning business which employed 100 workers. The developers who followed Hitchcock’s lead in Woodside were less flamboyant though similarly successful. In 1863 John Mecke bought farmland from a family, the Moores, who had lived for more than a century and a half on what would become the northern part of what would become Woodside. He intended to subdivide, but became insolvent and, in 1867, died. His heirs sold the property to two carpenters, Henry G. Schmidt and Emil Cuntz, who, in 1871, deeded their property to an organization known as the Bricklayers’ Cooperative Building Association. 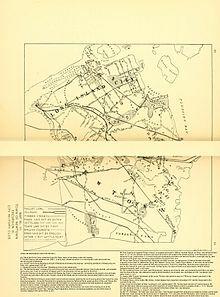 This organization seems not to have been what its name suggests since it was a New York corporation headed by Charles Merweg who gave his occupation as “speculator in real estate.” In any event, the Association erected a housing development in north Woodside which it called Charlotteville. The name was later given the more common spelling of Charlottesville. In 1886 another speculator, Effingham H. Nichols, divided property in the eastern part of the village and called it Woodside Heights. Other 19th-century developers included Charles F. Ehrhardt who sold lots in the northern part of the village and the Metropolitan Life Insurance Company which converted two properties on the west side into salable lots. These and other real estate developers profited from their sale of lots to home buyers, but the growth of Woodside’s housing market was hardly a smooth upward trajectory and, some 40 years after Hitchcock’s first lottery, the village was far from completely saturated with homes. A minutely detailed property atlas from 1909 shows buildings on considerably less than half of the village’s surveyed lots. In fact, although affordable by standards of the time, Woodside’s small single family houses on their small lots were too expensive for growing numbers of laborers who crowded the tenement apartments of Manhattan and nearby Brooklyn. In the years before the Panic of 1907 and again after its close, the wage-earners in many of these low-income families, having been able to improve their skills and obtain higher-paying jobs, began pressing for construction of housing that was better than the tenements but still within their means. Although real estate developers had previously thought Woodside to be too remote and rural in character for marketing of low cost rental units, some changed circumstances convinced them to meet this need by putting up higher-density apartment buildings in the village. The bi-level LIRR/subway stations at 61st Street and Roosevelt Avenue in Woodside. Single- and double-family homes, as well as small- and medium-sized apartment buildings, characterize Woodside’s housing stock. Chief among these circumstances were continued improvements to the public transportation network. This network continued to expand and Woodside evolved as a hub for railroad (the Long Island Rail Road’s Main Line electrified in 1908), elevated rapid transit (the joint IRT/BRT Corona and Woodside Line, 1917), and electrified trolleys (Newtown Railway Company, 1895, and New York and Queens County Line, 1896). With the incorporation of Queens into New York City in 1898 and subsequent passage of legislation mandating a five-cent citywide transit fare in 1904, Woodside residents had both abundant and inexpensive options for rapid public transportation. In fact the real cost of the five-cent fare declined dramatically during the inflation years of World War I and the 1920s, and it remained in place, despite further inflation, until 1948. The construction of bridge and tunnel connections to Manhattan—the Queensboro Bridge in 1909 and the Steinway Tunnel in 1915—enabled the working members of a tenement-dwelling immigrant family to rent a garden apartment in Woodside while having jobs in the central city. The commute was cheap and short, and during rush hours, the five-cent trip took as little as eight minutes to Times Square. Although other areas of Queens benefited from the expansion of cheap transit, Woodside was, back then, the only village in Queens with both railroad and rapid transit stations in addition to trolley lines. A second circumstance aiding the influx of upwardly-mobile low-income residents was a dramatic increase in local employment prospects. Although cheap, fast, and convenient transit made it possible for workers from Queens to have other-borough jobs, intra-borough employment opportunities were increasingly a realistic option. The waterside regions of Queens had long had substantial industries and businesses that benefited from access to water-borne transport. These commercial establishments multiplied as rail transportation became increasingly available and, in a virtuous growth cycle, as more prospective employees moved into the borough. In the late 19th and early 20th centuries, Woodside residents could find employment to the east in Brooklyn, to the north in College Point, and, especially, to the west. 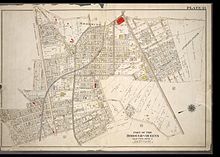 Hunters Point, Sunnyside, and other west-Queens communities possessed foundries, rail yards, chemical works, and numerous factories, including the famous Steinway Piano factory. When, in 1870, these communities formed themselves into Long Island City opportunities for employment grew rapidly, so much so that by the turn of the 20th century, the city could boast that it had the highest concentration of industry in all the United States. There were jobs within Woodside as well. The village had long had the city’s largest cemetery, Calvary, as a stimulus to local business. It also possessed a brewery, a major florist, and many local retail establishments. In 1875 the Bulova Watch Company established its headquarters there (where it remains to this day). As in nearby communities of the time, religious observance played an important role in the lives of Woodside residents, and its churches both reflected this importance and signaled welcome to prospective newcomers. Its first church, St. Paul’s Protestant Episcopal, showed the dominant faith of the area’s oldest and most prominent residents. It was established in 1874 by the families of landowners who had farmed there from its earliest settlement as well as by the estate-owning Germanic families that had moved in during the middle decades of the 19th century, including the longstanding Rapelye, Hicks, and Rikers families and the newly arrived Sussdorf, Windmuller, and Kelly families. Two years later, residents from among the still newer owners of small houses set up a Baptist church. St. Paul’s originally had a small congregation of only 50, with twice that in 1900; the Baptist church had about the same. St. Sebastian, Woodside’s first Roman Catholic church, served a considerably larger population upon its 1896 foundation. That year, the families of working-class residents, mainly of German descent, convinced the bishop of the Brooklyn Diocese that they should not have to travel to other villages to attend Mass. The number of church members, originally 300, quickly grew and was reported to be 1,000 in 1902. In addition to its other advantages, prospective home buyers were enticed by Woodside’s places of entertainment. One of its first businesses was a brewery, which had long possessed rooms where men could gather and drink. In the second half of the 19th century it became renowned for its beer gardens and dance halls. One early resident, Julius Adams, bought a tiny house on one of Hitchcock’s small lots. At first he earned his living as a shoemaker, and, succeeding in that business, expanded into others. In 1881 he built Sanger Hall—a German-style beer hall, a dance hall, and performance space for German singing societies and theatrical entertainments—and as the Hall thrived, he added dining rooms and even a bowling alley. In 1889, another resident built Heimann’s Hall, a beer garden, dancing pavilion, and dining hall. Early in the 20th century a movie theater joined the options for local leisure-time activity. 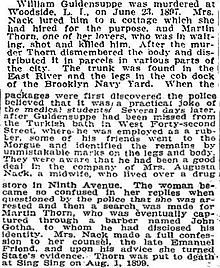 Extract from a news article about a 1897 murder in Woodside. As the 19th century gave way to the 20th, Woodside’s plentiful advantages convinced real estate developers to invest substantially in high-occupancy housing and duplex homes to complement the single-family units which had dominated the area. Three representative examples are Woodside Apartments built in 1913, the Metropolitan Life Insurance Company‘s project of 1922, and the projects of the Woodside Development Corporation in 1923. Located near the rail and rapid transit stations, the Woodside Apartments was a row of four-story, semi-detached buildings. There were four apartments on a floor, most of them having four rooms. Rents initially ranged from $18 to $20 a month. Located just as close to the trains, but on the other side of the village, the Metropolitan Life apartment project was more ambitious. Consisting of ten five-story buildings, the project had space for four hundred families. The Woodside Development Corporation built four-story apartments with stores on the ground floor and both two- and one-family houses on two large plots of land near the center of the village. When a city-wide aerial survey was taken in 1924, Woodside was shown to have quite a few other multifamily apartment buildings and duplexes along with its many small single-family homes. During the 1930s and into the post-war era, Woodside residential development continued to grow, although more slowly than in the boom years following World War I. Empty lots continued to be filled with one- and two-family houses, compact apartment buildings continued to be constructed, and larger, elevator-style high-rises were put up. In 1936, a last large tract of undeveloped land was made available for construction of garden apartments when a portion of the 10-acre Windmuller Estate was sold to developers. A community profile, published in 1943, characterized Woodside (along with Winfield, its neighbor to the south) as “a district of small homes and middle incomes.” The area still had few apartment buildings and very little industry. Although the rapid population growth of the 1920s had fallen off in the 1930s, the authors of the profile expected improved transit (the IND Queens Boulevard Line which opened in 1933) and a new shopping center to draw larger numbers of new residents. The number of single-family houses is given as 2,159, double-family houses as 1,711, and larger residential buildings as 868. In 1949, construction was completed on the Woodside Houses, a public housing complex built and operated by the New York City Housing Authority. The complex consists of 20 six-story buildings with 1,358 apartments. It is located in western Woodside, bordering Astoria, between 49th and 51st Streets, 31st Avenue and Newton Road. Part of Woodside Avenue and Doughboy Park from near the south-east corner of Windmuller Park. The entrance to Windmuller Park in Woodside. At the turn of the 21st century, Woodside was finally seen to be built up. The neighborhood nonetheless continued to be seen as an attractive place to live—characterized by “wide avenues, leafy streets and a mix of private homes, small apartment buildings and the occasional towering co-op.” The population was about 1,800 in 1880, 3,900 in 1900, 15,000 in 1920, and 41,000 in 1930. By 1963 it had grown to about 55,600 and was 90,000 in 2000. In 2008 the chairman of the local Community Board said that large apartment buildings were replacing smaller ones and single-family homes were being converted into multifamily rental properties. At the same time, real estate brokers told a news reporter that interest remained strong among families looking for affordable housing near Manhattan. As in other parts of New York City, centuries of tumultuous change have not totally obliterated old landmarks. Within Woodside, the double-decker station of the Long Island Rail Road (built in 1869) and the IRT Flushing Line (built in 1917) both remain, and were renovated in 1999. A trolley barn at Northern Boulevard and 51st Street has been preserved as the Tower Square Shopping Center. The New York and Queens Railroad Company built the barn in 1896. A transportation hub like the LIRR/IRT stations, it was the largest car barn in Queens. Woodside also possesses an ancient tree, not the great chestnut (which was gone by the end of the 19th century) but a large copper beech of somewhere between 150 and 300 years’ age. Documents in the archive of the Queens Historical Society suggest that it might have been planted during the time of the Revolutionary War. Among the oldest of Woodside’s historic landmarks are its cemeteries. Calvary Cemetery was founded in 1845 by trustees of Manhattan’s St. Patrick’s Cathedral for Roman Catholic burials and was later expanded by the addition of three sections comprising New Calvary. Calvary and New Calvary’s combined 300 acres (120 ha) contain over three million burials. Located on 54th Street between 31st & 32nd Avenues, the Moore-Jackson Cemetery is much older and smaller than Calvary. Established in 1733, it is one of the oldest cemeteries in New York. Only fifteen graves remain visible, the earliest dated 1769. Although few have been documented, some of Woodside’s old buildings still remain in place. Of those for which information is available, Woodside’s first church, St. Paul’s Protestant Episcopal, holds pride of place. It was damaged by fire in 2007 but still stands in its original location. An article published on the Forgotten NY weblog in 2005 lists this and other interesting structures from 19th century Woodside which have survived. All are located close to the center of town. They include the Hook and Ladder Company (1884), the home of Otto Groeber and his family (1870), the Woodside Pavilion (1877), and Meyer’s Hotel (1882). Another article on this blog shows structures from the early 20th century that are still standing. The character of Woodside’s population, in terms of national origin, has changed radically over time. Its first inhabitants were Native Americans, probably of the Mespeatches, who gave their name to the town of Maspeth. The first European landowners were mainly Dutch and English and their laborers mainly British, African (slaves), and American Indian. During the nineteenth century, Germans largely took over from these first settlers. In addition to the major Germanic landowners already mentioned (the Kellys—whose name was originally Kölle—Riker, Schroeder, Schmidt, Sussdorf, and Windmuller), the first purchasers of Hitchcock’s little plots were largely of German extraction. They included men with names like Eberhardt, Groeber, and Schlepergrel. Beginning at the close of the 19th century and through most of the 20th, growing numbers of Irish residents arrived and Woodside eventually became Irish enough to earn the nickname “Irish Town.” A major turning point in the transition from German to Irish occurred in 1901 when the Greater New York Irish Athletic Association formally opened a large athletic complex called Celtic Park on the border between Woodside and Laurel Hill, its neighbor to the south. A second turning point was the death of Louis Windmuller, the last of the German estate owners. Prominent in local as well as city and national affairs, he was called the “grand old man” or “patriarch” of Woodside. Although the estate did not go out of his heirs’ hands until the close of the Depression and beginning of World War II, his passing nonetheless helps mark Woodside’s transition from country village to suburban bedroom community. With large-scale residential development in the 1860s, Woodside became the largest Irish American community in Queens. In the early 1930s, the area was approximately 80% Irish. A subsequent influx of Irish occurred during the 1980s and into the early 1990s when many Irish immigrated to New York due to poor economic conditions in Ireland. Many of these “new Irish” settled in Woodside, where the men found work as construction workers or bartenders while the women worked as waitresses, nannies or domestics. Toward the end of the 20th century, Irish dominance gradually yielded to a mixture of other nationalities, but even as the neighborhood has seen growth in ethnic diversity today, the area still retains a strong Irish American presence, and there continue to be a number of Irish pubs and restaurants scattered across Woodside. After World War II, baby-boomers born in the area were primarily of Irish, Italian and Jewish extraction. Gradually, Dominicans and other nationalities began to make an appearance in the community, beginning in the late 1960s. A trend of diversity began then, and has continued since. This diversity has been remarked upon by many observers and can be shown in residents’ places of worship. For example, the Winfield Reformed Church began in 1880 as a Dutch Calvinist church and in 1969 became the first Taiwanese congregation in America. Others of Woodside’s places of worship now include ones that are Hindu, Thai Buddhist, Romanian Orthodox, Filipino, Korean, Chinese, and Bahrainian. Woodside has a strong Muslim community and is home of a large, multipurpose organization, the Islamic Institute of New York. Among St. Sebastian Mass-goers, a priest reports that are about 45% are Hispanic (particularly from Colombia and Mexico), 25% Irish, 25% Filipino, and 5% Korean. In 1999, Woodsiders came from 49 countries and spoke 34 different languages. In the early 1990s, many Asian American families moved into the area, particularly east of the 61st Street – Woodside subway station. In 2000, Woodside’s population was 30% Asian American. Woodside has a large population of Thai Americans, Korean Americans, Chinese Americans and Filipino Americans (see Koreatown, Chinatown, and Filipinotown), each with their own respective ethnic enclave. There are also South Asian Americans, particularly Indian Americans, Bangladeshi Americans, Nepalese Americans, and Pakistani Americans, as well as a large Dominican and Latino population. Reflecting its longtime diverse foods and drink, the neighborhood is filled with many cultural restaurants and pubs. It is also home to some of the city’s most popular Thai, Filipino, Colombian, and Ecuadorian eateries. Woodside’s diversity lends itself to a number of festivals and street fairs. It commemorates Saint Patrick’s Day with a parade prior to the famous celebration in Manhattan. Woodside also hosts several events in the summer, including an Independence Day street fair. For more details on this topic, see Filipinos in the New York City metropolitan region. A “Little Manila” stretches from 63rd-71st Streets on Roosevelt Avenue, where many Filipino-owned businesses have flocked to serve Woodside’s large Filipino American community; the neighborhood is known for its concentration of Filipinos. Of the 85,000 residents of Woodside, about 13,000, or 15% of Woodside’s population, are of Filipino background. Filipino restaurants dominate the area, as well as several freight and remittance centers scattered throughout the neighborhood. Other Filipino-owned businesses including professional services (medical, dental, optical), driving schools, beauty salons, immigration services, and video rental places providing the latest movies from the Philippines dot the community. This area attracts many local Filipinos and non-Filipinos alike and from neighboring places of Long Island, Connecticut, Pennsylvania, and New Jersey. In February 2008, the Bayanihan Filipino Community Center opened its doors in Woodside, a project spearheaded by the Philippine Forum. The Philippine Forum also hosts the annual Bayanihan Cultural Festival at the Hart Playground in September in commemoration of Filipino American History Month. Woodside hosts New York City’s only Saint Patrick’s Day parade that invites members of New York City’s LGBT Irish community to march; it is called the St. Pat’s For All Parade. The parade has attracted such politicians as former NYC mayors Rudolph Giuliani and Michael Bloomberg, Jason West (mayor of New Paltz, New York), New York Congressman Joseph Crowley (who represents the district), former United States Senator Hillary Clinton and others. Chris Gethard, author, comedian, and star of the Comedy Central show Big Lake. Kevin McShane, singer-songwriter Elliott Murphy manager in the 1970s and literary agent at Fifi Oscard Agency.